Mr. Lincoln had met James Harlan only once before he came to Washington, D.C. in February 1861. On Saturday, March 2, President-elect Lincoln requested that Senator James Harlan meet him at the President’s Room in the Capitol. “I at once arose, walked to the room, tapped on the door, and was admitted. He received me cordially, and, after the usual civilities, gave me a seat, and seated himself near me, saying, in a familiar way, that he had sent for me to tell him whom to appoint for heads of the Departments of the Government. I, of course, treated this observation as a pleasantry, remarking that as I understood it that duty belong to him; that I had not given the subject any consideration, that I expected to be satisfied with his selections, and that I had no names to suggest.” Mr. Lincoln asked which jobs he thought should go to Salmon P. Chase and Simon Cameron. Harlan recommended Chase for Secretary of the Treasury and Cameron for Secretary of War. “This interview lasted, probably about ten minutes. And I soon had reason to think, and still think, that my advice was effective in settling that question.”1 Harlan had earlier warned President-elect Lincoln by letter that there was considerable opposition among congressional Republicans to Cameron being Secretary of the Treasury. There were also many similarities in their backgrounds. They both had grown up in Indiana and moved west. Both studied to become lawyers and became accomplished speakers and debaters. Both were Whigs in Democratic states who became active in politics at an early age – Harlan had to declined nomination for the governorship in 1850 because he wasn’t yet the constitutional age of 30. Both were named as anti-Nebraska Senate candidates after the 1854 legislative elections in their states — but Harlan’s friends proved more powerful than Mr. Lincoln’s and he went directly to Washington for the next 18 years. Both Midwesterns were advocates of temperance and careful, logical speakers who supported their arguments with facts. Both used the mails to mobilize their friends. Both experienced the frustration of friends disappointed in the distribution of patronage. Both were men of integrity and probity – though after the Civil War, Harlan’s career was marred by allegations of fiscal improprieties that he strongly denied. Harlan’s relationship with President Lincoln became closer in 1865 – aided no doubt by the growing closeness between Robert Todd Lincoln and Mary Harlan, who eventually married in October 1868. Two events occurred in the last 45 days of the President’s life that established Harlan’s connection with Mr. Lincoln in the public mind. First, Harlan and his daughter Mary were in the party of the Lincoln entourage at the inaugural ball. Mary accompanied her future husband. Harlan’s relationship with the President was built on their personal similarities but also on Harlan’s role as an important Methodist layman – and as a close friend of Methodist Bishop Matthew Simpson, who had been his teacher and the preacher who presided at his marriage. 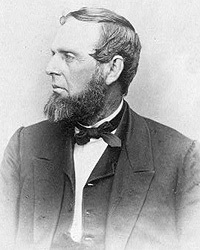 Simpson wanted Methodists to be better recognized for their support of President Lincoln – and boosting Harlan for a Cabinet post became his top priority after President Lincoln’s reelection. Bishop Simpson fought for influence – although he was careful not to do so publicly. At the end of 1864, and beginning of 1865, he took advantage of flux in Lincoln Administration. Attorney General Edward Bates of Missouri was replaced by another border state man, James Speed of Kentucky. Ohio’s Salmon P. Chase was appointed as chief justice of Supreme Court, less than six months after his left his Treasury Department post. Senator Fessenden took on that job for just eight months before returning to the Senate – leaving the Treasury post to Indiana’s Hugh McCulloch. That left Indiana overrepresented in the Cabinet – so Interior Secretary John P. Usher was asked to leave – making way for a Methodist representative. Although the appointment was made, Usher was granted a grace period in office and Harlan did not take office until after President Lincoln was assassinated. There was pressure from friends of Illinois State Auditor Jesse Dubois to received the appointment, but Mr. Lincoln was sensitive to charges that Illinois received too much patronage. 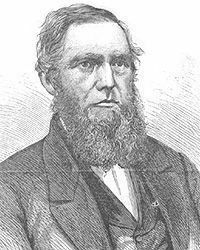 President Lincoln told Illinois Congressman-elect Shelby M. Cullom that he had promised Bishop Simpson to appoint Harlan: “The Methodist Church has been standing by me very generally. I agreed with Bishop Simpson to give Senator Harlan this place, and I must keep my agreement. I would like to take care of Uncle Jesse, but I do not see that I can as member of my cabinet.”9 By early 1865, the Harlan was appointment was generally considered a fait acomplis in Iowa and Washington. Harlan’s relationship to the President was recognized when he became president of the Lincoln Monument Association. 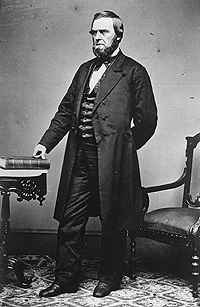 After serving as Secretary of the Interior in 1865-1866, he returned to the Senate for another term. Then his political luck turned bad and he lost races for the Senate and Governor of Iowa. 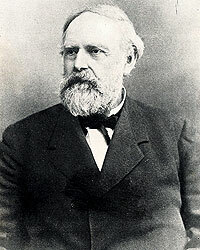 Johnson Brigham, James Harlan, p. 158-159. Thomas F. Pendel, Thirty-Six Years in the White House, p. 15. Johnson Brigham, James Harlan, p. 337. James A. Rawley, Edwin D. Morgan, 1811-1883: Merchant in Politics, p. 199. James G. Randall, Lincoln the President: Last Full Measure, p 252. Johnson Brigham, James Harlan, p. 337-338 (Speech at Iowa Wesleyan University, April 28, 1898). Robert D. Clark, The Life of Matthew Simpson, p. 229. Johnson Brigham, James Harlan, p. 185. Reinhold H. Luthin, The Real Abraham Lincoln, p. 556-557. Johnson Brigham, James Harlan, p. 192-193. Johnson Brigham, James Harlan, p. 194. Johnson Brigham, James Harlan, p. 195. Johnson Brigham, James Harlan, p. 197. Carl Sandburg, Abraham Lincoln: The War Years, Volume IV, p. 232.